My positive nugget for this week is no less than the man who is currently making waves in the international scene not as a glitzy performer that every girls and boys are going gaga, but a man of good deed. 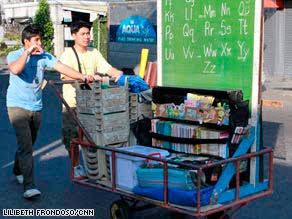 A simple man from the Philippines who grants every poor kid’s wish to read and write. For the last 12 years Efren is visible in the streets along with his group of teen volunteers who taught basic reading and writing to children who made the streets their home. Armed with a pushcart, yes a lowly pushcart, Efren’s team gives a different meaning to providing an education in an unconventional places like cemetery and dump sites. The pushcart contains stock of books, pens, tables and chairs. Efren’s story of greatness is featured at CNN’s Top 10 Heroes (Ordinary People Extraordinary Impact) for 2009. Let’s vote for the country’s pride. Read more about him and cast your vote. Thanks! This entry was posted in Uncategorized and tagged books, education, educator, Efren Penaflorida, pens, street, street education, teacher on October 25, 2009 by Yami. try ko den mag-vote sis.. mabuhay ang modern pinoy heroes! mommy, I voted for him too! Gus2 ko ang idea nya ha. I first knew his deeds sa tv. And I admire his kindness!